Awesome Book Mail from Kensington Publishing! 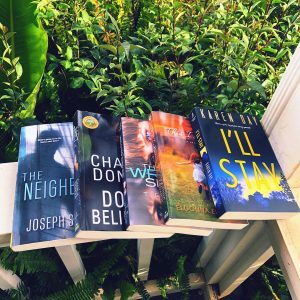 Kensington Publishing has some phenomenal new and upcoming releases! 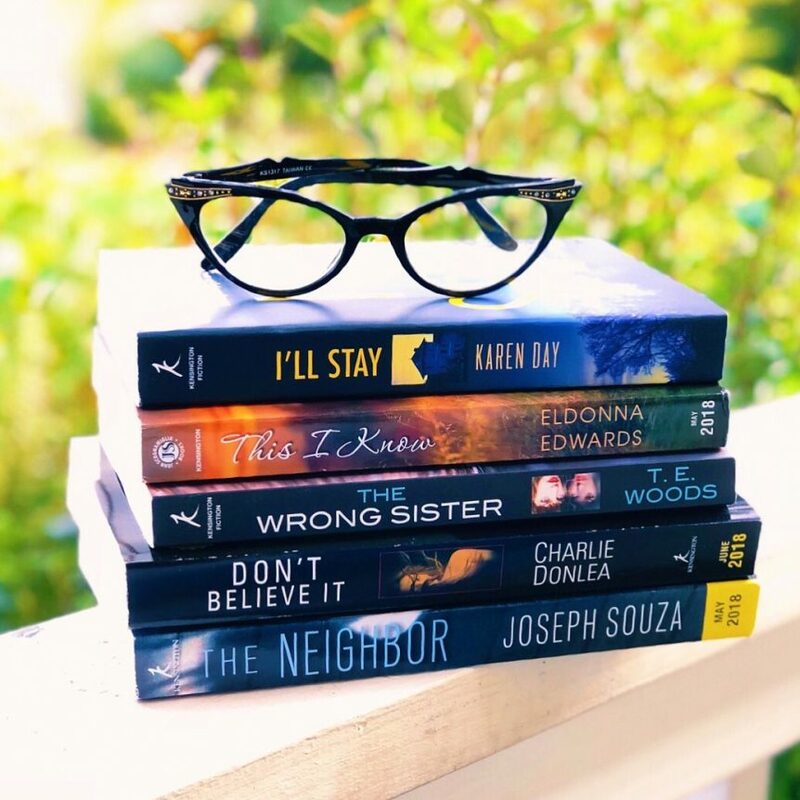 Just look at this gorgeous stack! So many amazing choices! I’ll leave the synopses below. DON’T BELIEVE IT by Charlie Donlea: The Girl of Sugar Beach is the most watched documentary in television history—a riveting, true-life mystery that unfolds over twelve weeks and centers on a fascinating question: Did Grace Sebold murder her boyfriend, Julian, while on a Spring Break vacation, or is she a victim of circumstance and poor police work? Grace has spent the last ten years in a St. Lucian prison, and reaches out to filmmaker Sidney Ryan in a last, desperate attempt to prove her innocence. I’LL STAY by Karen Day: There are some decisions you can never unmake. You can only atone for them—or try to. During her senior year of college, Clare Michaels takes a spring break trip to Florida with three other girls, including her best friend, Lee. She’s hoping for adventure and a few stories to share back at school. Instead, a string of bad choices leads to a horrific encounter, and Lee offers herself up so that Clare can escape. In the weeks and months that follow that fateful incident, Lee, once so dynamic and ambitious, flounders and withdraws. Clare was the only person to whom she’d ever confided about her troubled past. For Clare, that role felt like an honor—until it became a burden. Now she’s trying to make amends for her momentary selfishness by taking care of Lee—just as she’s been taking care of her high-strung mother, whose bestselling novel has been both windfall and curse. Years pass, circumstances change, and contact between Clare and Lee ebbs and flows, but the events of that night in Florida are impossible to escape. They keep dragging Clare back—forcing her to confront what really happened, and her part in it, in hopes of untangling guilt from loyalty and earning forgiveness at last . . . THIS I KNOW by Eldonna Edwards: Eleven-year-old Grace Carter has a talent for hiding things. She’s had plenty of practice, burying thoughts and feelings that might anger her strict Evangelical pastor father, and concealing the deep intuition she carries inside. The Knowing, as Grace calls it, offers glimpses of people’s pasts and futures. It enables her to see into the depth of her mother’s sadness, and even allows Grace to talk to Isaac, her twin brother who died at birth. To her wise, loving Aunt Pearl, the Knowing is a family gift; to her daddy, it’s close to witchcraft. THE WRONG SISTER by T.E. Woods: Sometimes a perfect stranger . . . From behind the wheel of her car, Tess Kincaid glimpses a woman walking down a Madison, Wisconsin, street. They’ve never met, but Tess senses an undeniable familiarity about her. Hair color, square chin, wide-set blue eyes . . . Tess sees the same features every time she looks in the mirror. Is neither of those things. Intrigued, Tess introduces herself and discovers that she and her doppelganger, Mimi, have more than appearance in common. They even share the same birthday. Mimi—confident and outgoing where Tess is understated and shy—is convinced they’re twins, separated shortly after birth. Tess, who’s felt unloved and unmoored since her mother disappeared years ago, only knows that there’s more than coincidence at play. And when a body is discovered in a local marsh, Tess is entangled in a search for the truth that will prove fascinating, disconcerting, and ultimately terrifying . . . THE NEIGHBOR by Joseph Souza: It all seems so promising at the start . . . When Leah and her husband, Clay, move from Seattle to Maine, she envisions a vibrant new neighborhood packed with families—playmates for her twins, new friends she can confide in and bond with. But while Clay works long hours to establish his brewery, Leah is left alone each day in a nearly deserted housing development where the only other occupants are aloof and standoffish. Bored and adrift, Leah finds herself watching Clarissa and Russell Gaines next door, envying their stylishly decorated home and their university careers. But Leah’s obsession with the intriguing, elegant Clarissa grows until she’s not just spying from afar but sneaking into their house, taking small objects . . . reading Clarissa’s diary. It contains clues to a hidden turmoil Leah never guessed at—and a connection to a local college girl who’s disappeared.